I like to look at the picture collections "The Big Picture" over at Boston.com. A couple of times each week, they show large pictures around a certain theme such as "Best nature pictures of 2012" and "The wake of Typhoon Bopha: Philippines." The last theme in 2012 was "Mongolia's nomads" with pictures from the country of Mongolia. Now, Mongolia is a country I've never head of before, I've always thought that Mongolia was part of China or Russia, and I've often confused Mongolia with Tibet. It is true that Mongolia first used to be a part of China, and then was a part of the Soviet Empire, but has since the 1990s been an independent country with democracy. The theory here is that if you've never even heard about the country before, there's a high probability that the Wall Street analyst's also never heard about the country since they are focusing on stocks like Facebook. So if you have never heard about the country, the probability that you have ever heard of any of the stocks from the country's stock exchange is even lower. And if no-one is interested in the stocks, you can probably find many undervalued companies. 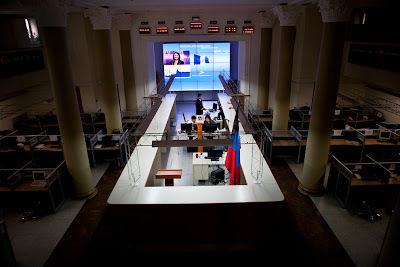 The Mongolian Stock Exchange was established in 1991 as a way to privatize government-owned assets after the fall of the Soviet Union. You could back then trade three companies for two hours each week, and the MSE used to be the smallest stock exchange in the world by market capitalization. Transactions were scribbled on scraps of paper and prices were marked on a blackboard. But things have now changed. You can find the MSE inside of an old children's cinema, but the exchange has now upgraded its brokering software system thanks to a partnership with the London Stock Exchange. The MSE with about 300 listed companies was the world's top performing stock exchange in 2010 with a gain of 121 percent, and the second best performing stock market in 2011 with a gain of 73 percent. The performance in 2012 was -18.8 percent. The reason to the great performance is because Mongolia is rich of commodities and is geographically very close to China, and the nickname of the country is now Minegolia.